If celebrating COOKIE Month wasn’t enough, this week we are celebrating National Pizza & Vegetarian month! Don’t you love these crazy “holidays” that give us an excuse to throw a little celebration? If you ask me, I will take any excused to indulge in pizza and cookies, so this is my kind of month! 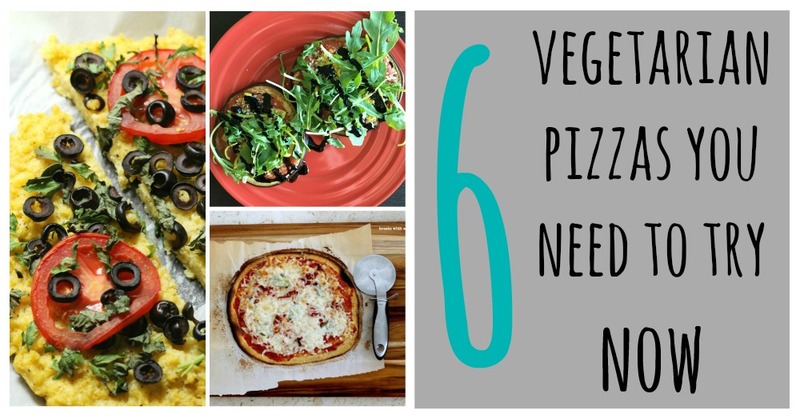 To help with the celebration, I have pulled together a nice variety of vegetarian pizza options from some of my fellow bloggers that I know you are going to love! Ready to dig in? The only problem here is trying to figure out which pizza to make first! Which pizza will you try first? Thanks for sharing mine! The others looks DELICIOUS! These sound delicious! Definitely need to try the eggplant pizza. Those all look so good! Our pizza night is usually on Saturday! I love pizza!!! I’ll have to give these a try for sure ? You’ll have to let me know when you do! Such a variety! The banana one looks super yummy! It looks like dessert pizza! ? These sound great! Pizza is one of my favourite foods and I’ve been looking for more vegetarian recipes lately! WOW!! These all look and sound great. I am all about switching up my normal meaty favorites for some vegetarian ones. Thank you! great simple recipes cant wait to try! Mmmm those look SO good. I would love to try the banana pizza- looks like the perfect way to have a better-for-you dessert. Oh wow I will for sure try some of these! They sound so good! I just had vegetarian pizza last night! One of my favorite dinner ideas (up there with vegetarian taco night since it’s so easy). Going to check out polenta pizza recipes, thanks! Mmm taco night! I made butternut squash tacos last week! SO good! I’m obsessed with homemade pizza. I actually am keeping a day-long fast today and my husband and I want to break the fast this evening with a veggie pizza! Pizza sounds like the perfect way to break a fast! Me, Me I want pizza waving my are frantically. Can’t wait to try some of these out. I love all of these but I think polenta would make a perfect pizza crust! Thanks for sharing these!